Vex IQ is a robotics platform that was designed to change the STEM learning model for young students and their teachers (grades 4-8). With this intuitive tool-less system, the students are able to jump right in and snap robots together, and that helps open a passion and curiosity of robotics that stays with them for their entire life. At JBE, their teams compete in several regional contests in areas including Monticello, Henderson State University, Star City Schools, UALR, and many more. Teams in the Vex IQ Challenge can be awarded The Excellence Award, The STEM Award, and/or The Judges’ Award. The Excellence Award is the highest award presented. This award is presented to the team that represents overall excellence by creating a high quality VEX robotics program. This team is a powerful challenger in multiple award categories. Excellence award winners must have an Engineering Notebook and a STEM Research Project presentation. The STEM Award is given to the team that shows the most efficient STEM Research Project presentation. Their presentation, as well as the discussion the team has with the Judges afterward, clearly shows the students’ depth of understanding of their topic and research findings. Their presentation will also showcase and highlight their work by sharing what they learned effectively. The Judges’ Award is presented to the team that the Judges decide deserves special recognition. Judges consider a lot of criteria for this award, such as team displays of special aspects, admirable effort and determination at the event, or team accomplishments or dedication throughout the season that may not fit under existing awards. All, nonetheless deserving of special recognition. 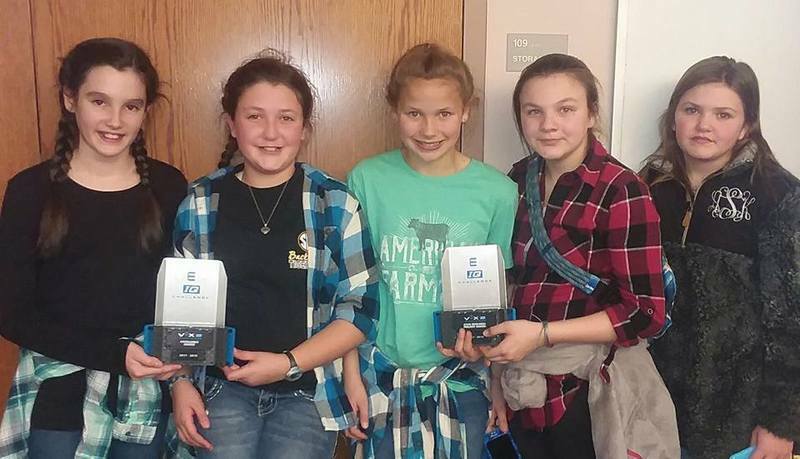 The Barefoot Bulldogs, members being Presley Story, Claire Haley, Jolie Robertson, Bryleigh Myers, and Kendall Socia, with Lucas Stone and Grant Dutton as Mentor Members, has won 4-Excellence Awards, 3-STEM Awards, and a Judge’s Award. They will now be traveling to Iowa for the National Competition and Kentucky for the World’s Championship at the beginning of May. Best of luck to The Barefoot Bulldogs at National and World VEX competitions! LtoR: Claire Haley, Presley Story, Jolie Robertson, Bryleigh Myers, Kendall Socia.